Records of coalmining in Denton and Haughton can be traced to the early 1700s and there are indications that it went much further back than this. One early record can be found in the Parish Registers of Denton Chapel (St Lawrence's Church) for 1743. There were numerous shallow pits throughout the townships of Denton and Haughton but the names, and even the whereabouts, of some of these are now lost. The sites of some of these can be found on old Ordnance Survey maps, where they are marked as 'Old Coal Shaft' or 'Old Air Shaft' but without names. The following is a list of some known coal mines (aka pits) together with available details. Burton Nook Pit, Denton: There is some evidence that this was an 18th century pit in the hamlet of Burton Nook and the nearby Top Pit was probably contemporary with it. If it existed, then its location in the hamlet of Burton Nook is unknown. Ellis Pit (later Denton Colliery) was also referred to as Burton Nook Pit. Top Pit, Denton: This pit was situated on the south side of Stockport Road, almost opposite the site of the later Ellis Pit. It was recorded on the 26 April 1849 that the Big and Roger Mines (seams) being worked at Top Pit were exhausted and this was said to be the date of its closure. However, the shaft remained in use as the headgear was still extant in the 1920s. Adjoining Top Pit there was another shaft that was sometimes referred to as Air Pit and it is likely that this was used for ventilation purposes. Ellis Pit, afterwards Denton Colliery, Denton: This pit was sunk in 1841 at Burton Nook on the north side of Stockport Road by John Fletcher, uncle of Jacob Fletcher Fletcher. Great Wood Pit, Denton: This pit was situated about 525 yards south of Stockport Road between the top of Hardy Wood and Cemetery Road. After Ellis Pit/Denton Colliery, it was the second most important. Hard Mine Pit, Denton: This pit was a short distance to the north of Hardy Wood, close to Great Wood Pit. As its name suggests, it was the Hard Mine (seam) that was being worked. Horse Hole Pit, Denton: This pit was at the top of Hardy Wood, close to Great Wood Pit, and it was recorded that its shaft was being sunk in May 1846. It obtained its name from the entrance to the shaft, known as a 'horse hole, where horses were netted and lowered down the shaft to work underground. Hard Mine was worked in this pit. Unidentified Coal Pit, Denton: There is slight evidence that there might have been a third pit in close proximity to Great Wood Pit but its location and identity are unknown. 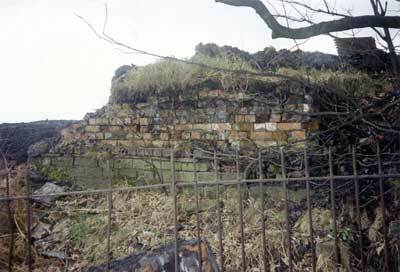 Hulme's Pit, Denton: This pit was situated by Hulme's Lane at the foot of Beat Bank by the river Tame. It dates from c.1730 but at an unknown date it was taken over by the Fletcher family/Denton Colliery Co Ltd who eventually used it as both a coal mine and a pumping station. It is likely that there were ancient and unrecorded drift mines in this vicinity that had been driven into the side of Beat Bank at points where natural outcrops of coal occurred. Unidentified Drift Mine, Denton: This was situated by Hulme's Lane between Hulme's Pit and Stockport Road. Donkey Pit, Denton: In Hulme's Wood close to Hulme's Pit and could be synonymous with it. It is believed that it got its name from a horse gin used for winding purposes. Unidentified Coal Pits, Denton: These adjoined Hulme's Pit and it is likely that they were earlier bell pits that were superceded by Hulme's Pit. Unidentified Old Coal Pit, Denton: Further along Hulme's Lane, by the river Tame, there was an 'Old Coal Pit' roughly opposite Arden Mill. Arden Colliery, Lower Haughton: Situated near Arden Bridge over the river Tame. Bayley Pool Pit, Denton: This pit was situated in Reddish Vale between the southern end of Horse Close Wood and a loop in the river Tame known as Bayley Pool. Dark Lane Pit, Haughton Green: Situated on the east side of Dark Lane, now called Mill Lane. Hardfield Pit, Haughton Green: Situated on the east side of Dark Lane, now called Mill Lane. Broomstair Colliery, Haughton: Situated on the south side of Hyde Road, close to Broomstair Bridge over the river Tame. To be sold····· Collieries &c + 30 acres of land - mine now in full work. Vein known as Great Mine, 6ft thick & Roger Mine, 3½ft thick. Known as Clarke's Broom Stair Colliery Estates of Nathan Hyde + Mr. Holford. Nathan Hyde, son of John Hyde, was born in Denton on the 12 March 1762. Another reference is for an unnamed coal pit shown at the location of Broomstair Colliery on the 1848 Ordnance Survey map. From 1859 until c.1878 Broomstair Colliery was operated by Messrs Silas Leigh and John Bradbury who also operated Clayton Colliery in Manchester. They were followed by the Hyde and Haughton Coal Company from c.1878 until 1889. By 1889 Broomstair Colliery and the nearby Hyde Colliery (aka Hyde Lane Pit) were both operated by the Hyde and Haughton Coal Company (aka the Hyde and Broomstair Coal Company) and the proprietors at this time were the brothers Joseph Watson Sidebotham MP (1857-1925) and James Nasmyth Sidebotham (1864-1904), of Bowdon, Cheshire, who were local landowners. From 1889 until the ultimate closure and abandonment in 1898 it was operated by the Dukinfield Coal and Cannel Company. On the 1 January 1889 the horse-keeper, James Richardson and his two sons descended the shaft to find themselves immersed in 9 feet of water, which had collected at the bottom of the shaft. James managed to signal for the cage to be lifted and all three were hoisted to safety. Shortly afterwards, water broke into the mine for a second time and it was abandoned. Some Broomstair Colliery employees were found work at the nearby Hyde Colliery and one of these, Thomas Shaw aged 35 years, was killed in the Hyde Colliery Explosion that occurred seventeen days later on the 18 January 1889. In spite of the above report, Broomstair Colliery did not close. Following the flooding it was was sold to the Dukinfield Coal and Cannel Company, which was the new name of the Dukinfield Coal Company. 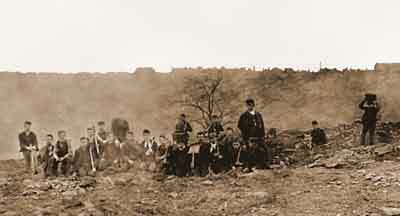 Later, the name of this company was changed again to Dukinfield Collieries Ltd.
During the autumn of 1893, coal miners' strikes occurred in the Lancashire, Yorkshire and South Wales coalfields that resulted in coal shortages and this photo shows townsfolk scavenging for coal on the slag heaps of Broomstair Colliery. Broomstair Colliery, Haughton, April 1990. Remains of a coal staithe at the side of Hyde Road. 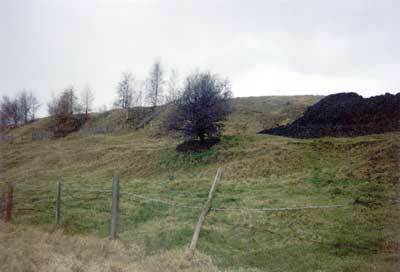 Slag heaps at the side of Hyde Road. Jet Amber Pit, Haughton: Situated in Jet Amber Fields in the vicinity of Farmers Fold on the north side of Hyde Road. This pit worked the Old and New Jet Amber Mines. The Lowes Arms on Hyde Road was once frequented by miners who worked at Jet Amber Pit and Broomstair Colliery. Unidentified Pit, Haughton: Situated in the vicinity of Quebec Street on the east side of Ashton Road, between Greswell Street and Tame Street. Unidentified Pit, Haughton: Situated in the vicinity of Pit Street on the east side of Stockport Road. The Jolly Hatters stands on the corner of Pit Street and Stockport Road. Albert Pit, Haughton: Off Tib Street, behind the Masons Arms Public House at Three Lane Ends. It was owned by the Denton Colliery Co Ltd. It is understood that this pit closed in 1886. Parsonage Pit, Haughton: Situated between Tib Street and Vaudrey Lane, it was about 250 feet from the north-west corner of the Old St Lawrence's Rectory, at the bottom of Vaudrey Lane. It was owned by the Denton Colliery Co Ltd. It is understood that this pit closed in 1886. Sycamore Pit, Haughton: This pit was said to have stood on the corner of Tib Street and its name might be synonymous with Roger Mine Pit. It was in close proximity to Albert Pit and Parsonage Pit. There was a Sycamore Inn off Tib Street that stood at the back of St Lawrence’s cricket ground on land between Tib Street and Whittles Farm. The cricket ground is at Sycamore Park, Clayton Street. At 11 o’clock on Saturday evening, 20 September 1873, a coal pit in Tib Street, Denton, belonging to the Denton and Haughton Colliery Co† was discovered to be on fire. Efforts were made by workers on the premises to put the fire out but without success and after two hours Captain Walker of the Denton and Haughton fire brigade was summoned. A continuous stream of water was poured on the flames and Captain Walker himself descended the pit, while constant relays of men directed their water hoses on the fire until 2 o’clock on Sunday afternoon. At this time the firemen were driven out of the workings by colliers filling up the upcast shaft and driving the foul air on them. The fire was still burning seven days later. The plan was to fill the pit with water. There was no one in the pit at the time of the fire. †This company name is possibly incorrect and it should read ‘Denton Colliery Co Ltd’. Note: The date of closure of this pit is unrecorded but it is likely that it never re-opened after this fire. FORTY-FOUR MEN AND BOYS IMPRISONED IN A COAL PIT. An accident of an alarming character happened on Tuesday at the Victoria Colliery, Haughton Green, near Manchester. At seven o’clock in the morning forty-four men and boys went down the ordinary shaft to their employment at the pit bottom, and soon afterwards the cage machinery broke, though it was not discovered until some hours afterwards. The men should have returned to the pit bank at three o’clock in the afternoon, but it was then found that the cage would not work, and some alarm was felt as to how the men could be released from their unpleasant position. After considerable delay temporary machinery was fixed up inside the chimney, a strong rope was lowered, and part of the chimney top having been broken down, the men and boys were drawn up, though with very great difficulty. The pit is nearly two hundred yards deep, and, as they could only be raised two at time, it was not until nearly midnight that they were all brought safely to the top. This accident occurred on Tuesday, 17 December 1872 and was reported on Thursday, 19 December 1872. Unidentified Pit, Haughton Green: Behind the Wesleyan Chapel (Haughton Green Methodist Church) on Two Trees Lane. Nibble and Clink Pit, Haughton Green: Sometimes known as Nibble/Nibland Pit, it was situated on the north side of Haughton Green Road behind the Bay Horse Public House opposite the entrance to Gibraltar Lane. It is understood that the pub was named after a favourite pit pony. It is believed that a Newcomen type atmospheric steam engine was installed here and the pit got its name from the noise made by the flat winding rope used. On Sunday, 20 July 1881, between nine and ten in the morning, a woman named Martha Sale, aged about 29, of Haughton Dale, who was the wife of Albert Sale, and who had been under medical treatment from Dr Smith of Woodley, took her little boy with her for a walk. She walked to the shaft of the Nibble Pit belonging to the Denton Colliery Co Ltd, and there she climbed over the fence, trying to pull her little boy with her, but she did not succeed. She then threw herself down the shaft (about 210 yards deep), getting one leg and one arm shattered and her body fearfully mangled. As soon as news of the occurrence was known some of the miners proceeded to the pit and secured the cage and then let down by ropes in a second cage, they brought the woman’s remains up in a sheet. Note: Albert Sale married Martha Downs at St Mary’s Church, Cheadle, in 1873 and their son, Fred, was born in Hyde in 1874. At the time of her death, Martha was aged 33 years. King Pit, Haughton Green: Adjoining Betty's Park (later Tommy Dodd). Tommy Dodd (aka Tommy Todd) was a large lamp mounted on a stone pedestal that originally stood in Denton market place. The townships of Denton and Haughton amalgamated in 1884 to form Denton and Haughton Local Board and to celebrate this event it was decided to move the lamp and pedestal from Denton and re-erect it in the centre of Haughton Green, an area then know as Betty's Park. The move took the form of a procession and local wits were quick to dub this as the wedding of Tommy Dodd and Betty Haughton. The move was unsuccessful and in March 1905 the lamp was removed and destroyed. However, Betty's Park became known as Tommy Dodd and this name is still in use. Haughton Green Road, early 20th century. King Pit Cottages, built in 1793, are on the left and between them and the next row of cottages was the entrance to King Pit and King Pit Farm. The single-story white building at the far end is the original Cricketer's Arms. 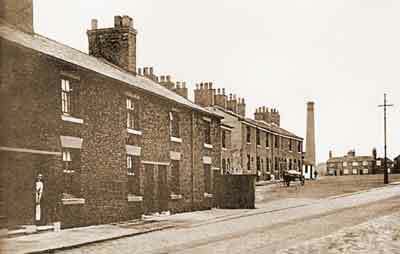 The tall chimney in the background pinpoints the position of Nibble and Clink Pit behind the Bay Horse public house. The chimney was demolished in 1923. Clinker Pit, Haughton Green: Situated on Worth's Lane opposite St Mary's Church. The last record of mining activity at this pit was in 1882. No doubt this pit received its name from the type of ash produced when its coal was burnt. Clinker consists of a hard mass of ash and partially fused coal. Unidentified Pit, Haughton Green: Situated about 275 yards east south east of Haughton Terrace on Meadow Lane. This pit closed sometime in the second half of the 19th century and was not marked as an 'Old Shaft' on Ordnance Survey maps at the turn of the 20th century. Access to it from Haughton Green Road was by way of a lane where Church Avenue and Rivermead Road now stand. Haughton Colliery, Haughton Green: Situated at Glass House Fold on the south side of Mill Lane in the angle formed by the lane and the river Tame. This colliery was owned by Thomas Shaw & Sons. Dans Wood Drift Mine, Haughton Green: Situated at Glass House Fold in the valley side. Mines at Glass House Fold must have been among the oldest in the area, dating from the reign of Elizabeth I (1533-1603), when Flemish refugees, skilled in the art of glass making and blowing, settled in the locality. Subsequently, George Hyde Clarke became the landowner and he held the mineral rights. In c.1793, George Hyde Clarke built a bridge (Clarke's Bridge) over the river Tame at the bottom of Mill Lane. He did this in order to improve the supply of coal into Hyde and also in anticipation of the opening of the Peak Forest Canal, in which he was a major shareholder. The lower level of the canal opened in 1799/1800. However, this single-arched bridge was seriously damaged, and possibly destroyed, by the great flood that occurred on the 17 August 1799. Notwithstanding this, a tramway was constructed from Glass House Fold, over this bridge, or its successor, along the side of Mill Lane for a short distance and then up the field by Hyde Hall to a wharf on the canal where coal from the pit, carried in horse-drawn waggons, was loaded into boats. The first lessees of Haughton Colliery were Messrs Brown and Clayton and it is likely that they were also the lessees of Dans Wood Drift Mine as well. These business partners were Thomas Brown and William Clayton who were also the lessees of the nearby Hyde Lane and Peacock Pits in Hyde on the Cheshire side of the river Tame. Moreover, Thomas Brown was the Surveyor and Resident Engineer for the Proprietors of the Peak Forest Canal Company. At about three o'clock in the afternoon of the 27 February 1910, two children, Sarah Leech (8) and Jack Bowker (5) fell down an abandoned shaft at Glass House Fold when the ground they were standing upon gave way. They remained trapped for 16½& hours until rescuers hoisted them up, unharmed, in a basket. The children had fallen down the former pumping shaft, which over the years had become overgrown with herbage. Afterwards, it was filled with clinker from the nearby Hyde Sewage Works. Wilton Pit, Denton: Existence and location uncertain. Angel Pit, Haughton: Hearsay evidence only. If it existed, then it was probably located near the Angel Inn on Hyde Road. Unidentified Air Shaft, Denton: On the west side of Seymour Street, north of Holland Street. The shaft was around 167 yards deep and it was near the Pentecostal Church. The National Coal Board filled and capped this shaft in 1965. Unidentified Pit, Haughton: On the south side of Hyde Road, opposite St Anne's Road. This pit was close to Broomstair Colliery. Unidentified Pit, Haughton Green: About 330 yards almost due south of Glass House Fold, alongside the river Tame. Unidentified Air Shaft, Haughton: About 235 yards north east of St Anne's Church. This air shaft may have been associated with Broomstair Colliery. Notes: In 1821, Robert Lowe was a coal proprietor in Haughton and Joseph Dickinson, in his List of Mines for 1854, states that Thomas Shaw and Messrs Leigh and Bradbury were coal proprietors in Haughton. The following coal mines were also recorded as being owned by the Denton Colliery Co Ltd. Reference: Collieries of the United Kingdom at Work in 1880.